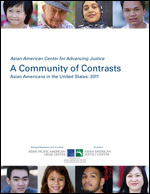 The Asian American Center for Advancing Justice just released a new report, A Community of Contrasts: Asian Americans in the United States, 2011, analyzing the latest demographic trends for Asian Americans. The demographic report, released today as a part of the Advancing Justice Conference, analyzes Census and other data on Asian Americans and highlights key issues facing the nation's fastest growing racial group. Asian American population grew 46% between 2000 and 2010. Asian American population growth over the decade outpaced that of any other racial group, including both Latinos and African Americans. In contrast, America’s non-Hispanic White population grew only 1 over the same period. Asian American entrepreneurs own over 1.5 million businesses, employing about 3 million people with an annual payroll of nearly $80 billion. Approximately 69% of Asian Americans old enough to vote are U.S. citizens. Of those eligible to register to vote, 55% have done so. Once registered, the rate of Asian American voter turnout still lags behind that of non-Hispanic Whites. Approximately 60% of Asian Americans were born outside the United States, a rate significantly higher than that of Latinos. Hmong Americans have the lowest per capita income of any racial or ethnic group nationwide, while Hmong, Bangladeshi, and Cambodian Americans have poverty rates that approach those of African Americans and Latinos. Asian Americans are also more likely than non-Hispanic Whites to be uninsured, with one in four Korean Americans being without health insurance. A Community of Contrasts is among a series of demographic reports by the Asian American Center for Advancing Justice, with the Asian American Justice Center and Asian Pacific American Legal Center as co-authors and APALC as principal researcher. The report sounds like a really helpful tool for Asian American policy-makers and community organizations. For more information and to download A Community of Contrasts, go to the Advancing Justice website here.